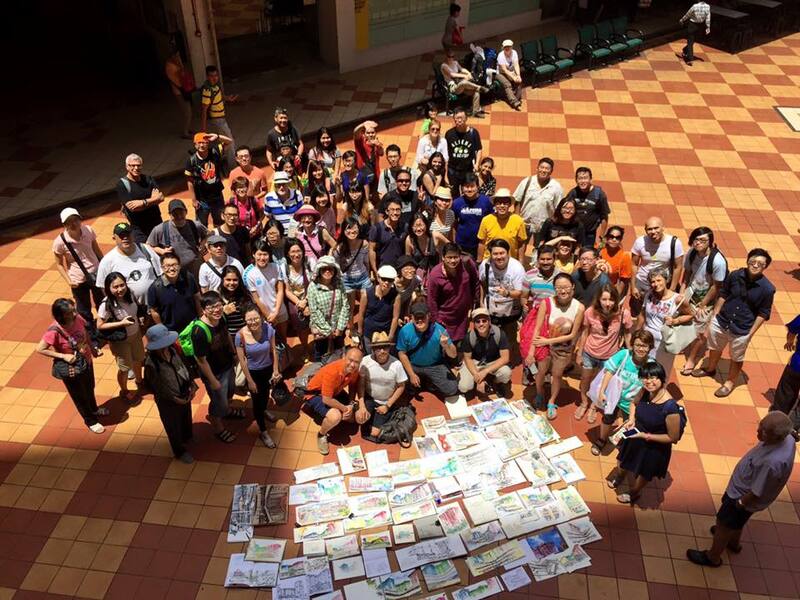 Last weekend was the February Sketchmeet of Urban Sketchers Singapore. The group met to sketch at Rochor Centre. Built in 1977 this commercial and residential estate has 4 colourful blocks which have become iconic structures of public housing. Rochor Centre will be demolished in 2016 to make way for an expressway. The price we pay for progress. I arrived late and took awhile to settle on a place to sketch from so I only had one and a half hours to do my sketch and add colour. Accurate renditions of complex buildings is just not my cup of tea so I chose to do a gestural set-up with watercolour pencil (ala Liz Steel) followed by watercolour and lastly pen. Even then those colourful apartment blocks were a challenge to draw. When I went to pick up my sketchbook from the floor after Show and Tell (I was almost the last to do so) I saw a lady walking away with my sketchbook and starting to look through it. When I rushed over, tapped her on the shoulder and said "it's mine" she looked really surprised! I can’t believe how lucky I was to have been in time to get it back! Moral of the story - do not be slow picking up your sketchbook!!! Here is the group photo at Show and Tell at the end of the 3 hour session. (Photo by Patrick Ng).